So as promised, let’s have a look at some of the Ready to Run (RTR) Stadium Trucks out there. Now strictly speaking a Staduum Truck (ST) Should be 2wd, however here we have a mix of 2wd, 4wd and eve some Nitro 2wd trucks added to the mix. I have included the 4wd Trucks because they seem to fit this genre best, and 1:10 Truggy really isn’t a term used much, and it tends to confuse them with their bigger brother the 1:8 size truggy. The T4.2 is the RTR offering from Associated, and while it’s not the most up to date platform from the brand, that far from makes it a bad truck. Associated know how to put together a good car, and so you shouldn’t overlook this offering which comes fitted with 3300kv Reedy combo, and there is even a Lipo combo with Lipo instead of the older NIMH batteries. 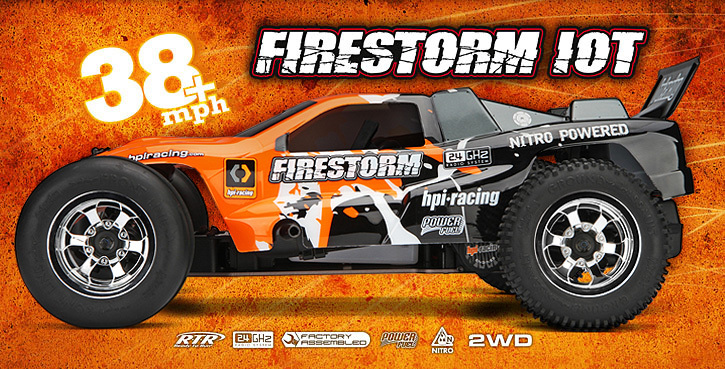 Now HPI have a lineup of 2 (and 3 depending on how you look at it) stadium trucks. My first stadium truck was one of their E-Firestorm 10T trucks fitted with a 15T brushed motor, and that is a vehicle that is still available to this day as well as it’s Flux (Brushless) version with a significantly more potent 4000kv brushless combo which is waterproof. Now we really can’t complete this list without looking at the trucks from Traxxas. The classic Rustler starts at the top of the Traxxas list, with of course the Brushless VXL beside it with it’s 3500kv, waterproof, brushless combo to push it along. Of note in the lineup is a Courtney Force and Pink editions of these trucks aimed at female bashers and racers. On the nitro side there are two offerings, the Nitro Rustler and Nitro Sport. Now outwardly the two look much the same, however chassis and motors are different on the two vehicles, with the Sport being a little paired back, and perhaps being the more budget of the two, and also has a lower top speed as well. 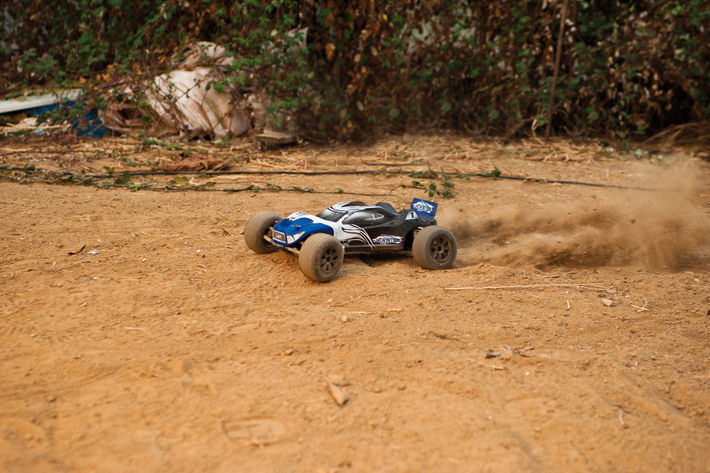 Many have not heard of this brand, but it is filling a niche at the entry level of RC cars very well. Yes their styling and paint schemes aren’t as pretty as some others, but they are a fairly new company at the bottom rung of the Horizon Hobby tree. The Circuit & Circuit brushless are the two offerings here in Stadium Truck. So you have the Circuit, 2wd Brushed truck, The Circuit 4wd Brushed Truck and the Circuit 4wd brushelss truck. Confused? Me too! However for their price, they have a lot to offer so they are worth checking out. A part of the group that owns Team Durango, ARRMA have a fairly rugged and practical line of vehicles ranging across most genre’s including ST. The Vorteks Mega Brushed is the entry level car with Brushed motor, plastic chassis and a battery compartment you access frum under the car. Move up to the middle of the line Vorteks BLS and you get a Brushless motor and speed controller, a new fancy paint scheme and a 7 cell nimh battery. At the top of the ladder sits the Vortekx BLX with a better brushless motor and speed controller including an in built fan on top of the BLS upgrades over the Mega car. You also get a TVP metal chassis rather than the plastic one of the Mega and BLS. All the cars in the range have waterproof electronics and seem to work well in any environment. A good package at a great price point. Ok, most people know LRP for their electronics in race cars, not for entire vehicles, however that’s no reason to discount them when trying to choose a new truck. Blast and Twister are the names of their 4wd (Blast) and 2wd (Twister) platforms. Both are available in brushed and brushless guises utilising the renowned LRP speed controllers and motors. In fact in the Twister Extreme a Outlaw X100 4.5T 4700kV Brushless motor is fitted, expect some serious speed here! One of the original Stadium Trucks the Stadium Blitzer was the RC car that first got me interested in proper hobby grade RC cars after seeing a pair on an oval track at a display in Devonport probably around the time of their release in the early 90’s. Along with the Stadium Thunder they are iconic vehicles in the RC circles, almost as much as the RC10T, perhaps more depending on who you talk to. Ok, to clarify, these are technically kits, not RTR’s, however there is a joy in making your own truck, and you certainly wouldn’t call these vehicles racers. So don’t overlook these classics when making your choice of ST.
Kyosho has the twin offerings of the Mad Bug VE and the Mad Bug Vei. Both are attractive 4wd Short Course Trucks with VW Beetle bodies, The Vei has the interesting feature of having one of the Orion all in one motor/esc combos, so there are less parts to fit in the vehicle, although one downfall is that if one part fails, both need to be replaced as it is the one unit. However the theory is sound and keeps the car’s electronics nice and simple. Now in the past Losi has made a rather nice 1:10 Desert Truck, but alas they no longer make it, however if you are looking lower on the scale chart you will find the 1:18 Mini Desert Truck. Same thing, but smaller! And smaller is not another word for worse, you can zip around in a smaller area, or even inside with these 1:18 vehicles, although they are far larger than the micro size of some of the smaller Losi offerings.